While the printer is working great, I see occasional banding- nothing major, but I see this as the last printer I buy this size and want to juice it for everything it's got. I already loosen the top alignment bearings- not much of a difference. 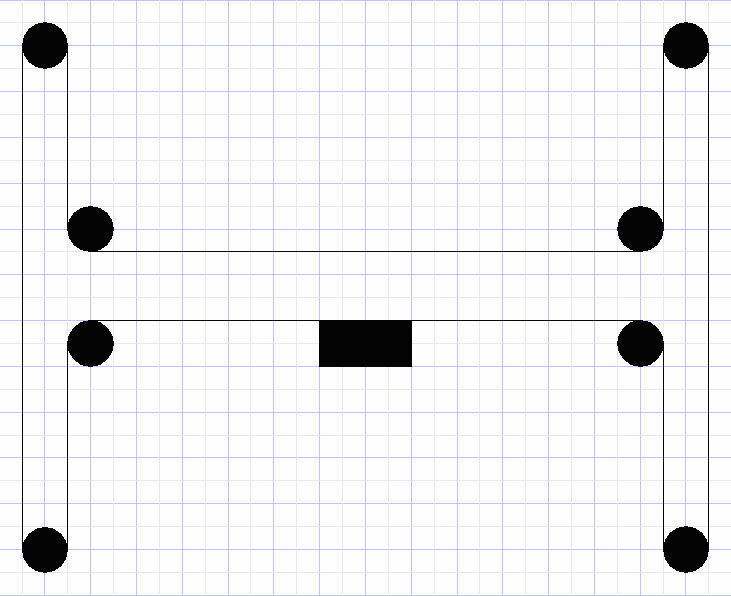 1- is T8 4 start (8mm per rotation) factory? 2 What length lead screw do I need? 3 and what is a very good sku/supplier? 1) Yes, M8 4 start is "factory"
Actually, there is nothing wrong with the stock lead screws assuming that they are not bent. Change to 40 tooth pulleys on the lead screws and install anti-backlash nuts and that will be a major improvement. Also, double up the guide rod bearings so that the platform can't tilt as much in any direction. I did these things long ago and so have others now. Photos of my setup have been posted in other threads. I can routinely print 0.1mm layers if I wish to now (never could before), but of course the prints take forever to do, so I rarely do that. I also noticed a possible minor design flaw, because the lead screws are belted, there is always side load on the screw and platform, I'm wondering if there is enough clearance at 400mm prints (I do large prints often) to put a second pully and belt on the opposite sides of the drive belt to negate some of that side loading. Also 2X guide rod bearings in genius. I ordered some Derlin nuts with anti-backlash springs, at $13 a pop, they better be good. I'm also switching all smooth idlers on X and Y to toothed, and switching drivers to 8825's oh, and In addition to up-sizing the X stepper, I'm also putting in a larger Z stepper to counter the torque losses from the 1/32 micro stepping- adding a 2/1 gear ratio on that would also improve torque- too bad Z-hop will be painfully slow- but that's why I have a delta. I'm making this machine as good as I possibly can- It was good out of the box, but every little upgrade helps. If either of the lead screws is actually bent, yes it should be replaced. Is the printer new enough that you could claim a warranty issue with FT or is it too late? I have purchased a number of things from RobotDigg and have always been happy with them, FWIW. But there are many domestic suppliers on eBay that are just as good and I have purchased from them as well without any problems. The side loading of the belts shouldn't be a problem as long as you don't have the belt guitar string tight, but then again I am running with both top and bottom bearings tight. There is a very simple technique to do this and get everything perfectly aligned, but it does presume that you have straight lead screws of course. You'll need to fix that first. Thanks regarding the doubled bearings. They work extremely well and are very inexpensive to add. I very rarely have to adjust the Z stop any more and haven't adjusted the bed levelers in ages. But seriously, the anti-backlash nuts are a huge improvement too. Mine are brass and I keep them lightly lubed with molybdenum "assembly" lube that can be purchased at any auto parts store. True, they could be a bit of a mess if you wipe up against them with a white shirt sleeve or something, but I keep away from them and have had no issues in that regard. I changed out my idlers when I first built my printer. I never used or liked the OEM design. As for the 40 tooth pulleys and Z speed, it isn't an issue. Mine runs just fine and in fact I sped up the Z motion quite a bit. With the 2:1 reduction it has plenty of torque. I also changed the X and Y motor pulleys to 16 tooth versions. It made a significant improvement in print quality. And one of these days soon (perhaps over the Christmas holiday) I will be changing it to an "H" drive setup to remove the mass of the X stepper from the carriage. I have all the parts on hand to do it, I just am lacking free time at the moment. Yeah, I'm probably within the window, but the screws are like $8 a piece and not worth waiting for emails and shipping to me. H-drive setup? like a core XY? trying to picture how to remove the X stepper from the Y rail. I had the top screw bearings perfect, probably shouldn't have removed them, but I wouldn't have known that I had a bent screw. Ron, what is the reason for 16 tooth pulleys? I wish you and some of the other seasoned folks would start a discussion on what upgrades to do, in what order and their benefits. Because honestly I think I will be tinkering with the R2 as soon as I get it going again. H-drive setup? like a core XY? The motors would be at the two rear positions. The four middle ones would be mounted to the left/right carriage. If you move the left motor clockwise and the right motor anti clockwise equally, the carriage will move toward the front of the printer ("down" in the view) and the extruder (black box) would not move left or right. If you move the two motors in the same direction equally, let's say clockwise, the carriage would not move up or down but the extruder would move toward the left. If you move only one of the motors while holding the other stationary the carriage and extruder would both move making a diagonal path. I built an Ender4 printer a while ago and it uses the "H" drive method. It works about as slick as it gets. And it is quiet too. So I want to try it on my FT5 V1 to remove the mass of the X motor from the carriage. The only thing a true CoreXY setup (dual belts) really buys you that I can see is that it would be more rigid. But from what I saw on the Ender, this type of setup works just fine. As long as the carriage runs true along the Y slides all should be good. With the nice rails and sliders this shouldn't be an issue, but if it turns out to be one I am prepared to switch to a roller carriage like the Ender has. The original 20 tooth pulleys yield a basic X and Y resolution of 80 steps/mm (with the stock microstepping setup and motors). The 16 tooth pulleys yield a resolution of 100 steps/mm, or ~25% finer (depending upon how you care to look at it). But they also provide a greater mechanical advantage for the drive system because the motor torque acts upon a smaller radius. So you gain finer resolution and more thrust (for the lack of a better term) for the small cost of two pulleys on Y and one on X. And I can run the motors a bit faster to make up for it without them even trying hard. I didn't even bother to change out the idlers at the other ends of the motions and have seen no ill effects doing that. I suspect that this may be beneficial if I do switch to an "H" drive as well. I wish you and some of the other seasoned folks would start a discussion on what upgrades to do, in what order and their benefits. Actually there are several such discussions, though mostly for R1 printers. However the same things apply to the R2 (mostly, because some are now standard features on the R2). Neat, I would like to see a build of that. If I did a build like that, I would use the biggest steppers that would fit. Actually, you might not want to do that. The problem with larger frame steppers on the X and Y axes is that their higher rotor inertias can limit rapid accelerations and decelerations. On the Z axis though it doesn't matter as much because it accelerates and decelerates far slower even when operated very fast. The 17-frame motors being provided with these printers are quite well suited for this application. But I will be doing everything possible to limit the mass of the "X" carriage bar. Such as possibly perforating the 2020 bar stock or even replacing it with a carbon fiber tube. And perhaps changing back to a Bowden extruder setup (once again). 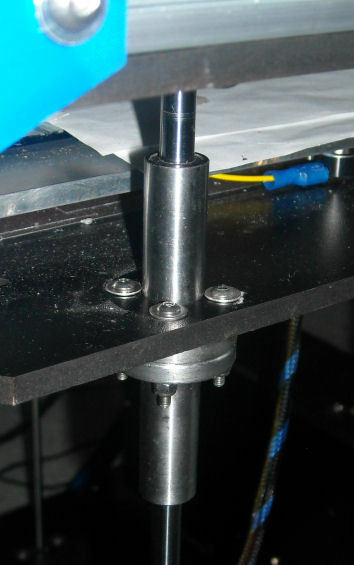 The ball sliders on the Y axis have very low friction and if the screws that fasten them to the carriage bar are kept tight, "racking" shouldn't be an issue. They can also be purchased with double sliders so that they can be spaced apart. If equipped with double carriages, "racking" would be nearly impossible. the linear rail it's self is pretty heavy, but IMHO the best way on a printer to keep things smooth and lash free and worth the weight. I'm installing a beefier 48mm stepper on X and putting the slightly weaker 48mm on Z. More than speed I focus on torque, complex models Love to snag your nozzle and ruin a print. at least on a ghost test cube, 80mm/s yielded almost ghost free printing, with the stock X stepper it was significantly worse. But I stick with 60mm/s for complex models and 70mm/s for simple stuff. I see no one here has installed 12mm guide rods, I know it's a $80 upgrade, but I think it would really put a hamper on Z-wobble (and at the same time improve machine rigidity.) My little 150mmX150mm Qidi has 10mm rods. 12mm guide rods really aren't necessary if you do the double bearing setup like I did. My build plate no longer has any appreciable angular play front to rear. It's quite an easy and rapid upgrade to do. That entire upgrade cost me around $14 as I recall. And the leadscrews, when mechanically linked together like mine are and as they are on R2 printers, prevent side to side angular play, especially if anti-backlash nuts are fitted. So the build platform becomes stable and predictable. As for the framework, it is the next thing needing attention. Especially if you remove the front center bar as many people have done (including me), the frame itself will begin to be an issue. Diagonal braces are a cheap and effective solutions to trapezoidal or torsional flexing. They make a world of difference and are extremely simple and cheap to install. I fabricated mine out of scrap strips left over from the thick heater plate I made. But perfectly good braces can be made from threaded rod and printed brackets. There are loads of examples of these on Thingiverse and elsewhere, or just use purchased metal brackets as used on some Prusa Mendel printers and others. The corner gussets are inadequate. Think of a stork standing on one very long leg. Their body sways in the wind while their foot is planted on the ground. Same thing on these printers- a lot of rapidly accelerating mass perched high up on a few stilts. I fully understand the cost aspects of producing these kits, but for less than $20 they could have provided the double bearings and the anti-backlash nuts as standard fitment. These would solve so many problems that users encounter. Why not offer it as an added cost upgrade? Same thing with a diagonal brace kit. I printed off some bracing and even designed and printed Y-rail T plates and Filament holder. The upgrade was well worth it, but it ate an entire roll of Raptor PLA, still waiting on my L-brackets for the top of the unit. I kept the front bar on, it's not a big deal to work around it for me. Reeeeeally want the carriage from 713 maker, but it's on galactic back-order, the ACM is reasonably stiff, but it's the weak link now since the frame has been stiffened up. Cool! I need to do that next. So I got the 40T gears and 8825 drivers, and the derlin nuts should be here tomorrow, but now I have to wait for the screws. Also I was just going to up the steps via LCD but it would take a unhuman amount of time to scroll up, so now I have to go through firmware...ugh. going from 1/16 to 1/32 step X2 adding 40T gears X2 So from 400 steps to 1600 steps- That's a lot of steps! If the motor has the torque to accurately microstep, I should be able to print any height I want with no rounding errors. Does the stock belt fit the larger gears? I think it should, but you might have to move one or both of the idlers slightly outward. This shouldn't be any problem, just re-drill the holes in the base plate where they are mounted. I should point out that I have an R1 printer using a gigantic 1350mm belt that links the two lead screws together. So I do not have hands-on working knowledge of the R2's setup. But from photos and the build manual it looks like there may be enough adjustment in the motor slot to compensate. As for the 1600 steps/mm setting, that shouldn't be a problem. The driver should be able to run that on the Z axis quite easily, and the larger pulleys will double the effective torque on the lead screws, so all should be good. As said before, I was able to actually increase the net operating speed of the Z motion on my printer with the new pulleys despite the number of steps/mm doubling. Won't fit with 40t gears, even extended the slot. Trying a 10t motor gear instead. Can you just remove one of the two idlers instead? I would think it needs to pull parallel towards each other. I'll just wait for the part. Just hope a 10T pully has enough grip. Not going to work, just realized after I ordered it it's a different pitch pattern. I should have ordered single start lead screws and effectively doubled the ratio. Looks like I got it to work, I had to really hog out some material and it looks nasty, but I designed and printed out a spacer on top to clamp the motor and cover up the grind work. Good thing I have a couple other printers in case one is downed.